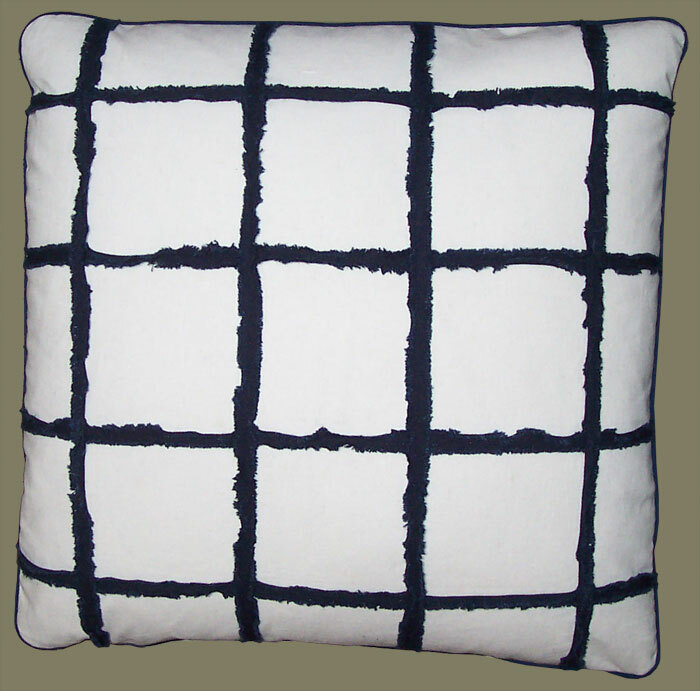 Description: Classic Blue and White Pillow Covers Embellished With a Window Pane Check Motif Created by Rows of Bias Cut Strips of Blue Cotton Applique on Fine Weave Linen/Cotton Fabric. Each Strip has been Frayed and Fringed to Resemble Chenille. These Limited Edition Decorative Pillow Covers Co-ordinate with Floral Blue and White Covers A and B, as well as the Stripe and Wood Block Print Pillows, in a Delightful Study in Print and Pattern Mixing. Combine with Ornaments and Artifacts of Blue and White to Carry the Theme, or Juxtapose with the Family of Yellows and Gold and/or that of Terra Cotta and Primer Red. Pillow Covers Have Self Welt Detailing, are Completely Lined in Cambric, and Have Zipper Closures. Please Inquire About Custom Feather/Down Inserts.